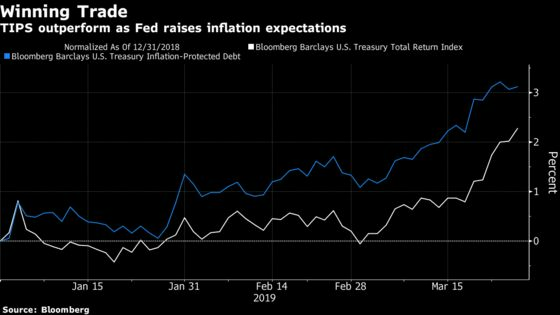 (Bloomberg) -- With the bond market painting such a bleak picture of the U.S. economy, it might seem a little odd to bet on a pickup in inflation. Yet for Pimco, Vanguard and BlackRock, that is exactly where the money’s at. While inflation has failed to consistently reach the Federal Reserve’s 2 percent target for years and the die-hards have been stymied by false starts time and again, the fund giants say the central bank’s dovish pivot is a game-changer. A tight labor market, and the Fed’s willingness to consider putting off raising interest rates this year and letting inflation run hot, are bound to raise expectations and push up consumer prices. That means getting into inflation-protected Treasuries, commonly known as TIPS. Indeed, even with all the bond market’s worries about a recession (see the inverted yield curve) and a full-blown rally in plain-vanilla Treasuries in the past week, TIPS have actually outperformed this year. Inflation-protected securities have returned 3.1 percent in the first quarter, wiping out all of last year’s decline, index data compiled by Bloomberg show. Their nominal counterparts have gained 2.3 percent. It’s not simply a matter of keeping score. Throughout the course of the decade-long expansion, inflation has been the one indicator that’s stubbornly failed to return to levels consistent with a healthy U.S. economy, despite the Fed’s best efforts. Based on the central bank’s preferred gauge, inflation has averaged just 1.5 percent a year since the end of the last recession. So, it’s easy to be skeptical of the inflationistas. Fed Chairman Jerome Powell has said inflation expectations are crucially important to actual price increases. Last week, he emphasized how detrimental a weakening outlook could be if it becomes a self-fulfilling prophecy. To combat that, the Fed not only scaled back its 2019 rate hike projections to zero, but also discussed the possibility of so-called price-level targeting. 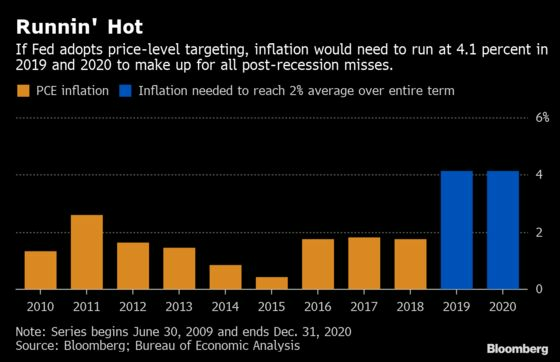 If the Fed took that approach, it would make up for years when prices rose less than 2 percent by allowing inflation to run higher than 2 percent in subsequent years, rather than letting past misses be bygones -- which it does now. In the bond market, the difference between yields on TIPS and nominal Treasuries provides a proxy of investors’ expectations for long-term inflation. Known as the breakeven rate, it currently shows that traders see consumer prices rising average 1.83 percent a year over the next decade. Over 30 years, the expected inflation rate is still under 1.9 percent. To illustrate just how much hotter the Fed could let inflation run, consider a hypothetical. As we know, its preferred rate of inflation has averaged 1.5 percent during the expansion. If the Fed wanted to make up for lost time and lift that long-run average to 2 percent by the end of 2020, it would need to get consumer prices to rise 4.1 percent annually this year and next. 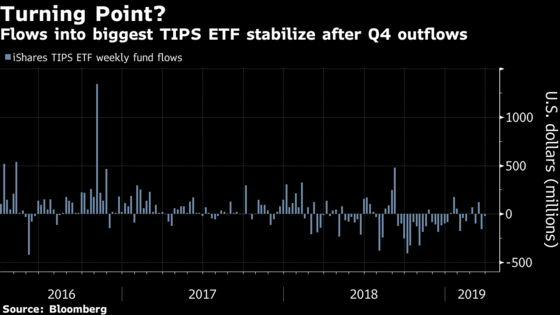 Richard Turnill, global chief investment strategist at BlackRock, which oversees $6 trillion, said in a note this month that TIPS are “an attractive alternative to nominal bonds.’’ He cited a growing economy, the Fed’s patience on rates and its willingness to let inflation temporarily accelerate past 2 percent. Morgan Stanley’s Guneet Dhingra isn’t quite sold on the idea that inflation expectations will continue to rise. While TIPS may continue to marginally outperform, most of the optimism over inflation has already been baked into the price. Going forward, any further gains in TIPS will likely be due to the end of the Fed’s rate-hiking cycle. Since the start of last week, the rally has slowed and yields on 10-year TIPS have fallen half as much as nominal notes. As for the inflation trade, “it’s about the law of diminishing returns,” he said. Returns on TIPS were also helped by their duration, which determines much their price reacts to changes in interest rates. The duration for the Bloomberg Barclays U.S. Treasury Inflation-Linked Bond Index is 7.49, slightly longer than the 6.23 for nominal Treasuries, data compiled by Bloomberg show. Nevertheless, there are signs that investors are stepping up inflation bets. Individuals, who pulled money out of inflation-linked products nearly every week last quarter, have started to return. Based on her models, JPMorgan Chase’s Phoebe White predicted in a report that flows into inflation-linked ETFs and mutual funds by U.S.-based investors for March will be “relatively robust.” Demand for TIPS from large foreign accounts such as sovereign wealth funds and central banks have also increased, according to Wells Fargo’s Boris Rjavinski, citing client interactions.